The Iguazu Falls along with the Nahuel Huapi National Park is the most frequented tourist sites in South America. 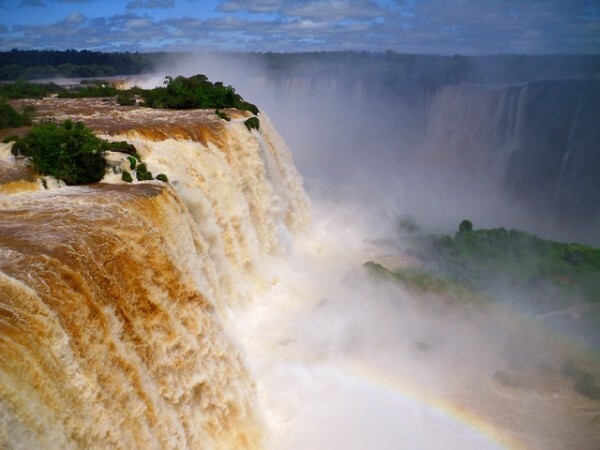 The etymological meaning of Iguazu in the guarani language means “great waters”. The site was discovered first by Alvar Núñez Cabeza de Vaca and was declared as a World Heritage site in 1984. The fall is sitated in the Iguazu National Park. The Iguazu Falls falls within both the country of Brazil and Argentina. The River Iguazú originates in the Parama state of Brazil. The river crosses a fault after flowing for about 1200 kilometers and then a canyon after which it drains in the Parana River. These faults are the result of Volcanic eruptions. The very vastness of the fall will keep you awed as it did to Eleanor Roosevelt many years ago who on seeing it exclaimed “Poor Niagra”. The Iguazu Falls is a part of the huge ecosystem which is protected by both the Brazilian and the Argentine national parks. Two third of the fall is in the Argentinian side. The whole area will take about two whole days to complete. The Brazilian side of the fall is more scenic and you can also see the whole panorama from a helicopter. You can see the Devil’s Throat from this side where there are atleast fourteen falls each dropping from a height of 350 feet, creating a spray which is atleast 100 feet in its force. A walk through the subtropical vegetation of the National Iguaçu Park will enthrall you. The Argentine side of the park you can do a series of catwalks from the Devil’s Gorge. Downstream you can see three flags of Argentina, Brazil, and Paraguay. This is where the river meets the Parana river as well. According to folklore in the area a huge snake by the name of Boi resided here. Boi was of a fearsome nature and often disturbed the aboriginal tribes that lived here. To pacify him each year the aborigines used to sacrifice a woman in the river. Once a courageous Gurani saved the woman from the river. Boi became so angered by the act that he split the river thus creating the cataracts. 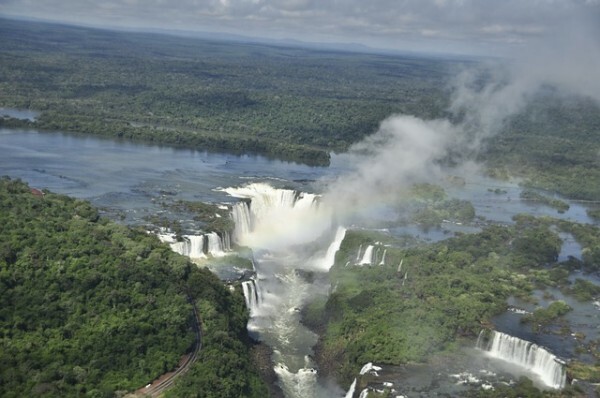 Iguazu Falls have five important trails on the Argentinian side. This is in the upper rim of the fall. It has some excellent scenery. This is at the bottom end. Keep a lookout for Salto Bossetti and Dos Hermanas. This area is accessible by boats. It’s a paradise for bird lovers. The train ride here for 1 kilometer is an amazing experience. A must do in your travel itinerary. Macuco Safari is a must do in the Brazilian side. It offers you boat ride to the very base of the Iguazu Falls. You will be taken into the vast jungle by a truck and the guide will explain the different flora and fauna that exists in the park. You have to take aboat ride to see the rapids in the region.